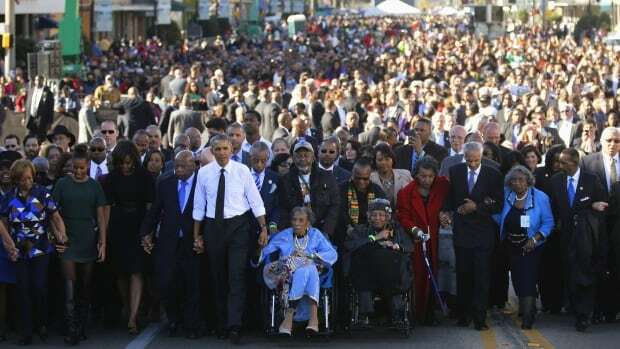 Barack Obama returned to Selma, Alabama, last Saturday, with an updated version of his speech on race delivered eight years ago, during another commemoration of the 1965 march over the Edmund Pettus Bridge. Back then, presidential candidate Obama told the crowd at Brown Chapel AME Church that Blacks had already come “90 percent of the way” to racial equality. He was implicitly predicting that the election of himself as the first Black president would propel African Americans to 100 percent equality, completing the journey and marking the end of racial politics in the United States. It was a bald-faced lie, by any statistical measurement. Blacks had never earned more than 66 cents on the white dollar, and would fall much further behind before Obama set foot in Selma, again. Catastrophically, Black median household wealth would collapse to one-twentieth that of whites under his watch. Last weekend, Obama returned to the subject of endemic racism. “What happened in Ferguson may not be unique, but it’s no longer endemic, or sanctioned by law and custom; and before the Civil Rights Movement, it most surely was,” he told the huge throng in Selma. How dare they malign the world’s first apartheid nation, a country that rose to superpower status on stolen land and labor, in such cruel fashion! The president’s reasoning also gives aid and comfort to the majority of whites, including youngsters, that now believe white people are the most discriminated-against class in America. If endemic racism has been all but eliminated and Black people have already achieved near-equal status, then Black protestations to the contrary are baseless and maliciously racist in intent. The real problem, therefore, is “reverse racism”: that Black Lives Matter too much. As anti-racist white scholars Paul Street and Tim Wise warned in the run-up to the 2008 election, many whites interpret Obama’s ascension as having removed any residual legitimacy from Black complaints. Obama’s rhetoric and behavior buttress that twisted worldview. Before going to Selma, Obama took care to preserve the impunities of killer cops. He stands firmly by Attorney General Eric Holder’s decision not to indict former Ferguson officer Darren Wilson on civil rights charges in the death of Michael Brown. The division of U.S. history into pre- and post-Selma eras is also a way of delegitimizing the struggles that continued after passage of civil rights legislation: the battles against domestic and global social injustice and the fight against what the Black Panther Party for Self Defense called the police “army of occupation.” Five years after the events on the Edmund Pettus Bridge, the national policy of mass Black incarceration had become fully operational. Over the space of two generations, an entire people would be criminalized by the Mass Black Incarceration State – what Michelle Alexander calls “The New Jim Crow” – a system so pervasive and unremitting that one out of every eight prison inmates in the world is now an African American. This is the system that Obama and Holder so vigorously defend. This entry was posted in REAL HISTORY UNCOVERED, IMPERIAL HUBRIS AND HYPOCRISY, FALSE FLAG OPS, 4th Media, MSM MANIPULATION, rise and fall of empires, IMPERIAL SOCIAL SYSTEMS ENGINEERING, HOW TO LIE WITH STATISTICS, despotic academia, ideological classrooms, Full SPECTRA Dominance, Revisionist History, Imperial Impotence, Panopticon Effect, non-Official Government Leaking for PR, Nobel Prize for Chutzpah, Academic Left, petit-bourgeois freedoms, Cultures of Narcissism, Chickenhawk Nation, Proto-Fascism. Bookmark the permalink.